The introduction of the Airbus A350-900 aircraft, which is more spacious, greener and quieter than previous models, is part of efforts by the Shanghai-based airline China Eastern. China Eastern Airlines has received its first of 20 A350-900 airplanes at Shanghai Hongqiao International Airport. Equipped with China Eastern’s latest passenger service system, this new generation flagship model promises to redefine intercontinental air travel with its advanced capabilities. The cabin of China Eastern’s first A350-900 is divided into three parts — a business class section with 40 seats, including four premium business seats, a super economy class area with 32 seats, and 216 economy class seats. In response to passengers’ diversified expectations for travel, the new plane also comes with an “Air Living Room”, its premium business class option which features new seats, the largest in-flight touchscreen in the airline, a next generation in-flight entertainment system, a full function bar, optimized cabin scene lightening, NFC (near field communication) reader for in-flight shopping, world premiere bluetooth earphone module, and high-throughput open spaces intersect. The balcony-styled business class, the first of its kind, is equipped with a host of amenities, including Thompson Vantage’s first “super business” products, 32-inch high definition touchscreens that are far larger than regular first-class allocations, mini-bars, convenient storage lockers, AC power outlets, and more comfortable three-point seatbelts. Super economy and economy class travelers will find their trip in the China Eastern A350-900 jets to be more comfortable thanks to the new stylish seats from Rockwell Collins. 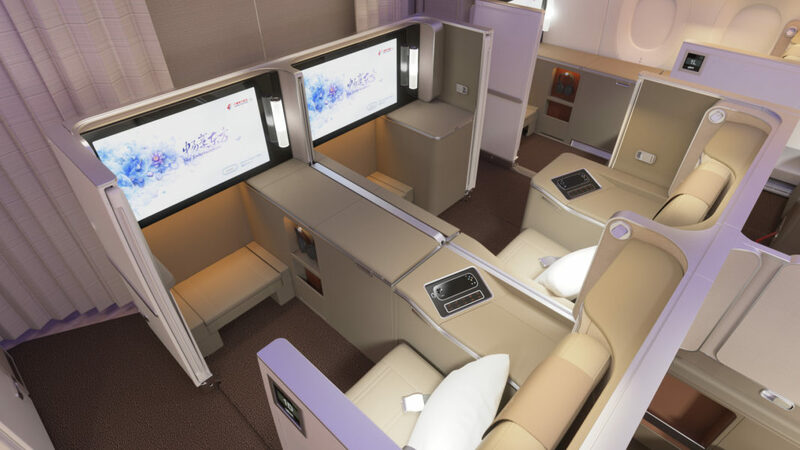 The 12-inch high definition display installed on each seat in economy class — it is the largest across all airlines in the world — provides passengers with a top quality viewing experience. Passengers can also look forward to more diversified media and entertainment content with China Eastern’s latest generation in-flight entertainment system, the Panasonic EX3/GCS, which is an all-round upgrade of the previous generation. Like all wide-body aircraft in China Eastern’s fleet, the new A350-900 is also equipped with the new generation in-flight Wi-Fi which has a maximum speed of 200Mbps. China Eastern’s “Kitchen in Air”, which comprises new microwaves, coffee machines and multi-functional fridges will also ensure that the cabin crew are always ready to meet the requests of each and every guest. China Eastern currently operates the world’s second largest and Asia’slargest Airbus fleet which comprises nearly 700 aircraft, including more than 360 Airbus jets. The company will receive two more A350-900 aircraft this year, with the last of the 20 aircrafts ordered scheduled to be delivered in 2022. All these new planes will be equipped with the next generation cabin service system. The first A350-900 will launch its maiden flight from Shanghai Hongqiao International Airport to Beijing Capital International Airport on December 4. The plane will gradually be used to fly routes to other major destinations including Guangzhou of Guangdong province and Chengdu of Sichuan province. Its international long-haul routes from Shanghai to Europe, Australiaand North America will begin in January, 2019.